In the past I worked for a large contract packaging company. The jobs come and go like lightning in this environment. This is a real high pressure environment for which no known script exists. Everyday is different, which meant I had to change my MO on electric systems design. I learned from the weigh machine project that this company cannot afford to wait for big rebuilds to get done. Instead I developed a minimally invasive method I call splice and/or control point technology. This is a very nonintrusive method I developed to bring about dramatic results in a short time. What we do is first meet to discuss the objective to be achieved. Above I am seated with a PLC circuit designed to detect if a desiccant packet has failed to fall into a food product pouch and if so shut the machine down. This was the objective to be achieved. Next I examine the machine to determine what existing devices and wiring I could use from the present existing configuration to bring about the result. Then I sit down to design and draw out a circuit that if SPLICED in could bring about the required changes. I build a model of the circuit and bench test it using simulated inputs and observe the program and circuit outputs using a laptop and an Oscilloscope Scope Meter. I debug the circuit if it has any errors and retest it. Then a day is scheduled when I can have the production machine to myself. (Usually on the weekend) and then I actually build the circuit into the machine and test it prior to actual use. I always preserve the return path. That is if the circuit fails to yield the desired results all I have to do is move a few wires around and the machine can still run the old way until I work out the problems with the new system. I learned the hard way that when you use unskilled labor to run high tech machines one will encounter some of the most impossible break down scenarios they could ever possibly imagine. For my PLC projects I use the Direct Logic Model 05 Series Mini Brick type PLCs most of the time. They are small, relatively inexpensive, easy to program and have a broad feature set that is useful in a wide array of situations. You can buy them from Automation Direct. 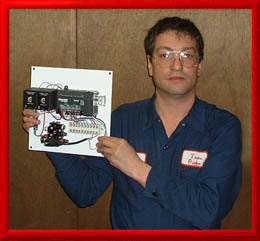 On the left is a link for a slide show on a few PLC projects I have built.